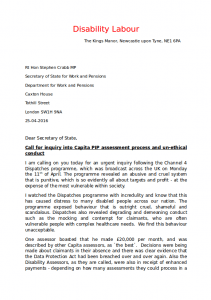 With extremely limited resources, we have attempted to do something about the PIP scandal, which is now discredited but continues to cause deep distress to tens of thousands of vulnerable people across the nation. Today, we launched our Change.Org campaign, calling for an inquiry and for the PIP programme, to be scrapped immediately. Its punitive and has no place in a a modern civilised society. In yesterdays Sunday Times, Zac Goldsmiths campaign team, cited the Governments relentless attack on the disabled, as the primary reason for losing the mayoralty to Sadiq Khan. Can you please sign the petition and forward to all your networks? Welfare reform is being designed by an ex banker (Lord Freud) and the assessments for ESA and PIP have been designed to ignore all evidence except for what can be used against the claimant to deny payment and support. It is the same illegal scam used buy banks via insurance companies with Payment protection insurance. The government since 2010 have agreed to this spiteful and injustice. Shame on David Cameron and the Conservative party. This was on his desk and for six years he has allowed it to happen. DISGUSTING. In a life time of unpaid caring,have never previously witnessed such savage and callous behaviour from any government toward the vulnerable. Breaching their human rights and causing immeasurable,stress,suffering and deliberate exacerbations of people’s already serious health issues. A brutal and cruel leadership by David Cameron and his extremist right wing government to abolish the safety net that is social security.A gross breach of not only trust but a criminal breach of a contract that UK citizens pay into for time of need and which is not being paid rightfully back to them. This government has trained it’s DWP and job centre staff to have the most inhumane attitude to carers and patients alike,that alone is something totally unforgivable,unprofessional and does nothing to enhance Britain as a progressive nation. As an ex nurse and midwife who lost that career due to caring but ‘didn’t really mind’ as it’s the ‘right thing to do’ this is like rubbing salt into the wounds of those who save the nation billions by propagandising our loved ones as feckless and undeserving and also even calling carers into job centres under the threat of their meagre pittance being removed. If ever a government has failed on multiple fronts,this conservative led one has.it has let down the people for an ideology which is wealth and power aspiring and which will never be fair,caring or compassionate. Shame on them and all they represent. I work in social care, supporting vulnerable people, enabling them become independent in their local community. Occasionally I have to accompany people to their assessments and my experience has been less than positive. Vulnerable adults suffering from anxiety, depression, enduring mental health issues being made to travel 15 to 25 miles plus. Appointments being cancelled either a few days before, or on the actual day, or after they have arrived at the assessment centre. Rearranged appointments being cancelled as well. eg I phoned up on Monday pm to make sure off an appointment for an individual on Thursday pm. Arrived at the centre to be told it was cancelled and rearranged to next morning Friday am, then to be told it was rearranged for 4 weeks later 30 minutes later. Then the individual received 2 letters within a few days with different appointment dates. And of course every time the appointment centre is on the 3rd or 4th level/ floor. The gap between the have and have nots gets bigger. ‘You can work, that will solve your problem’ – but no one will get a job without the right incentives to employers. Equal access is a right and that is what benefits are supposed to support. 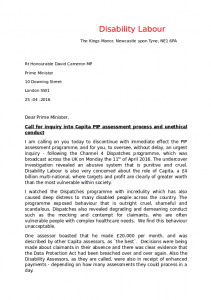 It is criminal the attitude to disabled people and the cuts affecting lives so badly. I read today in the Guardian about the appaulling and discriminatory methods used by the dwp from 2012 to 2014. Claiment’s with special needs, learning difficulties died because of the dwp’s lack of care and the governments insistance to move people from Incapacity benefit to esa in the fastest time possible. 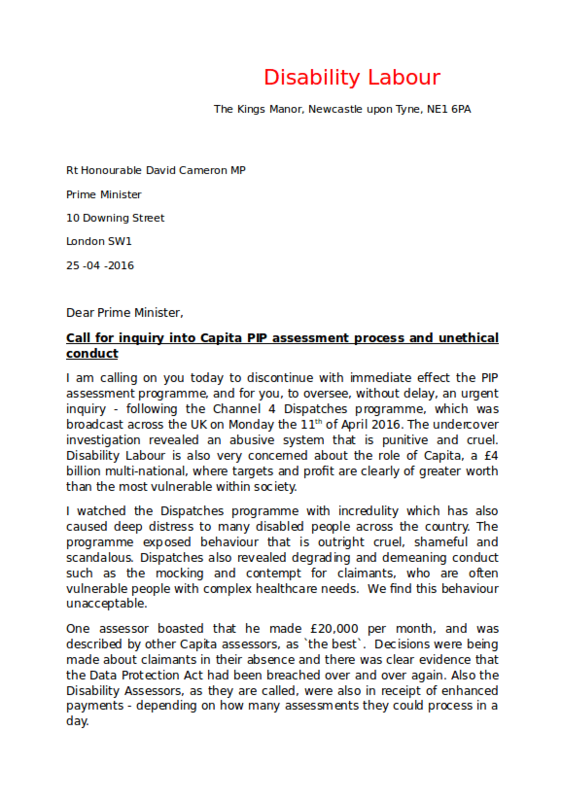 A total of 49 reports were compiled in which these flaws were highlighted to the dwp and government. Yet people are still being murdered by the dwp. Surely someone has to take these evil monsters to the Haig. 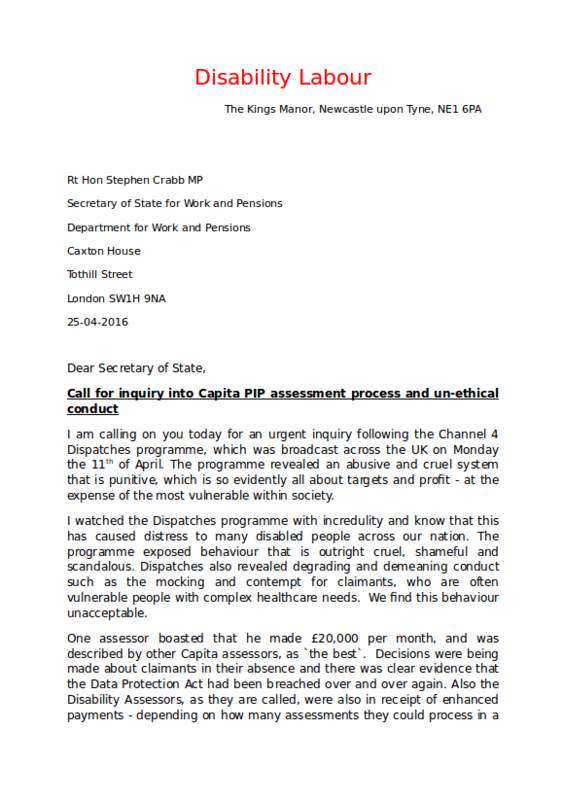 Ian Duncan Smith should beheld to account as should Stephen Crabb who is hell bent on not changing the wca or medical assessment for pip to ensure fairness, equality and redesigning pip so it reflects the actual needs of disabled people. In the independent there was an article about A man who was found fit to work who was paralised on his left side and due to undergo a medical procedure to be fitted with a metal plate in his skull. He has memory loss and is clearly unable to work. Not only that, no employer will ever employ him. While this government is hell bent on as they say “putting disabled people into jobs”. they are not creating legislation that forces companies to enploy disabled people. There is one clause in the Disability Discrimination act that allows employers to get out of employing disabled people. “If an employer cannot afford to make adaptions for a disabled applicant the act is not applicable”. Surveys have been done to prove this is happening. Yet this evil corrupt government will do nothing to even the playing field. They are only able to cut disability benefit for one reason and one reason only, to save money. There is no other reason. Disabled people have been demonised, disabledhate crime has increased since this evil government came to power. We are the weakest in society and unable to mobilise ourselves to protest in the numbers required to make our plight heard. the government knows this and are content to allow disabled people to ide to save money. Yet they are not saving money. The cost the nhs, appeals and other services has risen beyond any ammount that might have been saved. I admire those disabled people who do protest and do their best to bring to the publics attention our plight. The media are controlled by the government and won’t publicise these protests in the way they should. Graphic pictures of the man you’re talking about. When, oh when will it end? Well, after nearly 4 years of campaigning for an accessible ATOS centre/rooms for the shocking WCA Asessments here in Norwich (I came aboard a little way in) we were told last year when Maximus took over that they would be getting new accessible premises. We then waited for that to be announed (it was in the local press and online) to then be told that they now had ground floor room/rooms for WCA’s at the original place and our lovely Tory MP, Chloe Smith assured us, “it had been resolved”. There was no date and no official announcement, call me cynical, but I didn’t beleive them. I was then asked by a neighbour in my street what was happening last winter, she said she knew of someone in Norwich who was told he would have to go to Ipswich. Then before Easter, I was told by a man outside Norwich Jobcentre, that he had been for a WCA the previous day and they asked him to go upstairs to the second floor. He refused and used the lift and said he was putting in a complaint. 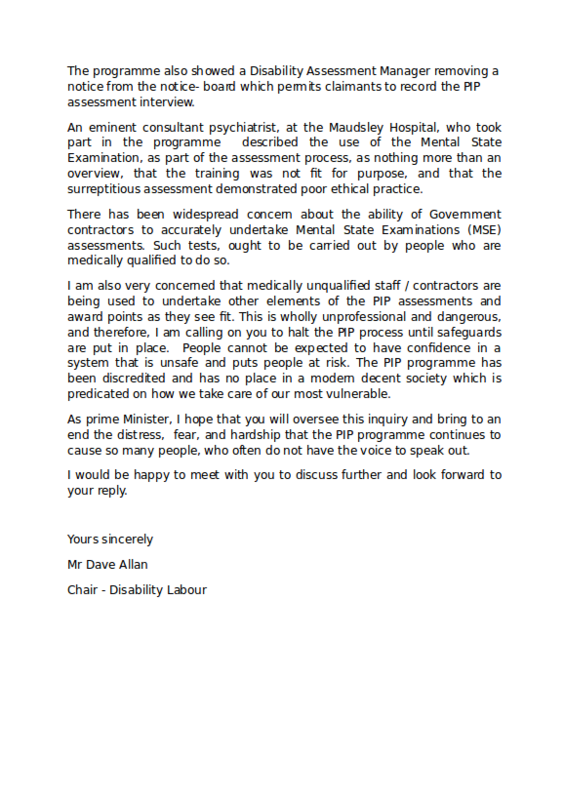 Fast forward to today, I have received my appointment letter for my first re-asessment, after being forced to go to Ipswich by taxi in 2014, by ATOS for my first WCA. This letter invites me to Norwich, so you think that’s ok, until you see a separate page, “Norwich Assessment Centre Insert”, followed by “Health and safety Notice”, this details that the assessment is on the 2d floor and if you can’t manage 37 steps in an emergency/other event, you have to contact them and they will “make other arrangements”. You then enter into the usual kafkaesque saga, as per ATOS, DWP, Capita etc., I am told there is a ground floor room, do I need it and he will have to e-mail someone to book this! I had also stipulated on the form (or Age UK) who filled it in did, that I couldn’t go between 23/5/ and 2/6/16 and they had booked me in for 24th May, done on purpose, when I asked about that, he dofdged itr and said sulkily “so you need to change the date?”!!! You get the drift, I’m very angry and distressed, but I will not tolerate this and am getting it looked into, my MP (spoke to last week, with a friend) local press and more. I listened to Stephen Crabb yesterday in the Guardian. He stated that he will create new benefit strategies with a view to saving money. He was as clear as mud what those strategies included. Yet in his first speech to Parliament after becoming the SS minister, he stated there would be no more cuts than the one’s already legislated for by the Government. Another lier, like the rest of them. One person who commented on Crabbs statement has attempted suicide and is threatening to carry it out in front of parliament. This is how these cuts are affecting disabled people. pip is not fit for anything, except recycledpaper. It is in effect a death sentence for disabled people. Those in charge are aware of it and should be held accountable. One single death due to the evil, discriminative and utterly unempathetic Tory Government. Is enough to take them to the human rights court. I watched Crabbs’ performance in front of the Select Committee and there is absolutely no change in direction for the government and the DWP, he even stated that he wanted to cut more than £12 billion from the Social Security bill and signalled more cuts to disability benefits. The only way to go is for ESA to be absorbed into UC and everyone pushed through their Job Coaches which Crabb likens to another emergency service. Which yes will be placed in GP surgeries and food banks. Whatever Mr Cabbs ‘smart’ strategies however is still up for debate but that is obviously the buzz phrase for his tenure at the DWP. 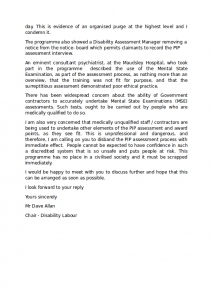 PIP assessment is faulty,with too much emphasis on physical disability – it is ridiculous to say if someone can only walf half was down the drive they are not fully disabled.They are completely inadequate – the s they should ask are things like “can you able to get to the local shop – to buy your milm and bread or “can you plan a trip to Bali – a normal expectation for the non disabled.This is 2016 and the world is round. It’s probably just me but I can’t find the petition. The link in your article goes to the change.org homepage. Trying to search from there throws up 6 pages for results. A direct link would be really handy! The discrimination against the disabled has got to stop. It’s like we are back in 1940s Getmany. And I don’t mean any disrespect to those who were there..just those who did the killing. 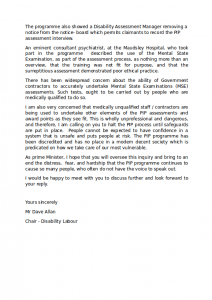 My recent PIP assessment was done bt Atos. Thought they’d been sacked but still going strong in the North West. Still had my PIP refused despite my condition being worse. But now mobility problems being targeted didn’t stand a chance. Daughter also refused PIP. Had low rate DLA since 7 yrs old. Now tax credits affected as disability element dependent on getting DLA/PIP. How does someone in the support group not qualify fot PIP ? Now going thru 2 mandatory considerations, hers & mine. 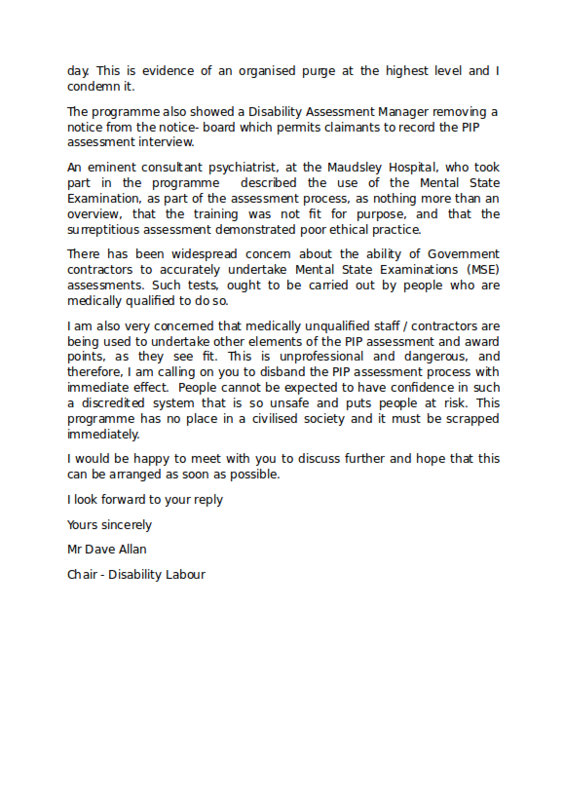 Plus my up & coming benefit fraud assessment for ESA – that masquerades as a medical. Although i am unfit for work i am working ceaselessly for my benefits & my daughters. Constantly collecting evidence that proves iam ill. Constantly being observed by OT who have just decided iam not sick enough for a blue badge. Appealing that too. decision. I declined as its under dispute. So didn’t get blue badge. Got DLA for. Life my illness is not going to change what the point. Pip is just there to take my money a way. And will cost the state more money.. I had been given dla for life but had to apply for pip which means my lifetime award has gone and have to apply again in 2025 I have MS so therefore as it is a proggressive ailment it wont get any better, I did get awarded pip though but had to go 25miles away to assessment centre in great Yarmouth as I live in Norwich for the MEDICAL ? No doctors No nurses just a foreign lady who told me just to answer her questions! As interview or MEDICAL!! went on and on I did try to tell her about my MS and she said she was there just to ask the questions! Please stop bullying Disabled people . Pick on the tax evaders instead. You all have blood on your hands and should imprison any Assessment Officer or DWP decision maker to prove you are serious.